Coverage of patient care and procedural skills help you provide safe, high-quality patient care along with technical proficiency.Step-by-step procedures are shown in photo essays, and are demonstrated with more than 400 full-color illustrations. 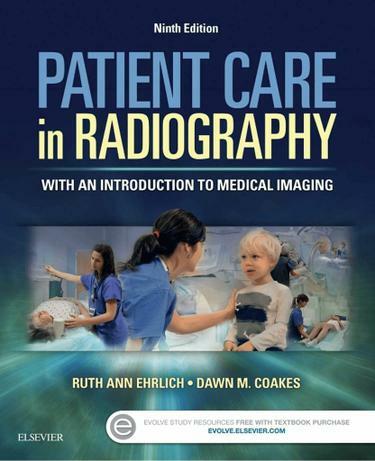 Information from the American Society of Radiologic Technologists familiarizes you with the organization that guides your profession.Case studies focus on medicolegal terms, standards, and applications, helping you build the problem-solving skills needed to deal with situations you will encounter in the clinical settingChapter outlines, objectives, key terms, summaries, review questions, and critical thinking exercises focus on the key information in each chapter and help you assess your grasp of the material.Coverage of infection control helps you prevent the spread of diseases.Special Imaging Modalities chapter provides an overview of patient care for a wide range of imaging methods.Answers to the review questions make it easy to check your knowledge. UPDATED practice requirements include ASRT Practice Standards and AHA Patient Care Partnership Standards.NEW contrast products and post-image manipulation techniques include the newest material on Cone beam utilization, MR imaging, image-guided therapy, and kV imaging.NEW images highlight many patient procedures, showing exactly how to care for patients.